The alluvial plains of the Ganges River system are known to hold one of the best aquifer systems in the world. The unique depositional pattern of the varied fluvial geomorphic features, e.g., channels versus floodplains, controls the disposition of varied lithology within the sediment assemblage, which in turn lays down the foundation for the aquifer-aquitard architecture within the Ganges basin. Hence, geomorphology is often used as a primary tool to understand the aquifer architecture that lies beneath at a shallow level. 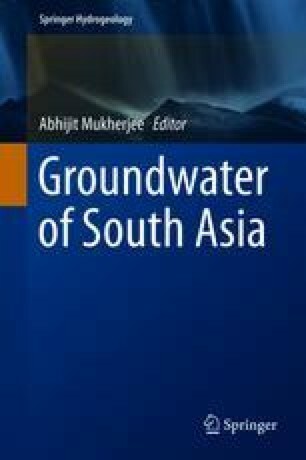 This article is aimed at establishing the effectiveness of using the fluvial geomorphic signatures to understand the shallow aquifer architecture of central Gangetic basin. The central Gangetic basin is mostly clay capped thus depicting a confined shallow aquifer, but a number of paleolake have been encountered at places due to migration of river through time. This area also exhibits dominance of active or abandoned channels, meander scrolls and point bars, with deposition of sand or coarser grained sediments. These geomorphic features being infiltration zones play a dominant role in increasing aquifer thickness and groundwater movement within the basin.